It’s early April, so all over Texas, people are following a grand tradition – pulling over to the side of the road and exiting for their yearly photo op in nature. The bluebonnets are blooming! Everybody knows that bluebonnets are the state flower of Texas — but did you know that there are actually five species in that category? 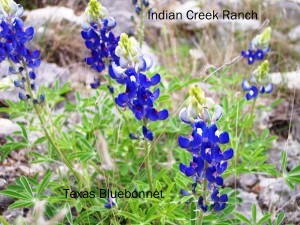 * In 1901, when the bluebonnet was made the official state flower, the species chosen was the Sandyland bluebonnet (Lupinus subcarnosus), which grows better in East Texas and is less showy. 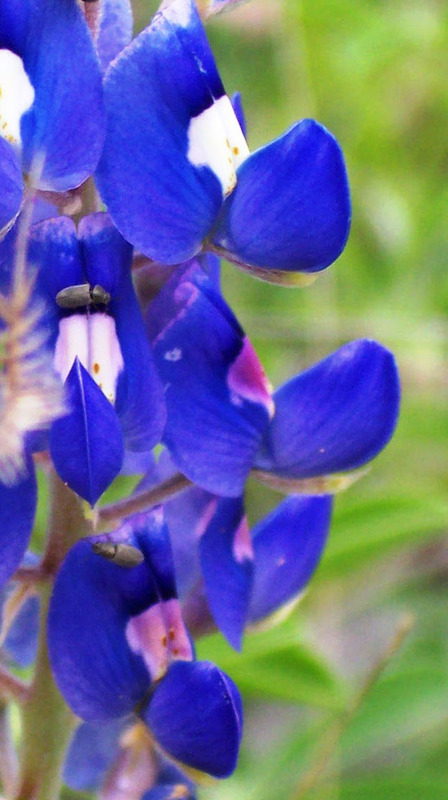 People preferred the fuller blooms of the Texas bluebonnet (Lupinus texenis), so the Legislature decreed that all flowers of the Lupinus taxa would be considered the state flower. Texas Bluebonnets. Photo by Jo Roberts. The other three species are Lupinus havardii, which is the very tall and thin Big Bend bluebonnet; Lupinus plattensis, which is the Dune bluebonnet found in the Panhandle, and Lupinus concinnus, the small Annual lupine,which is found near El Paso. It has hairy leaves and small purple blooms. Taking a closer look at the Texas bluebonnet, you can tell if one of the individual flowers on the stem has been pollinated, because the white spot on the flower will turn to dark red or purple. Pollinated and unpollinated flowers on the same stem. If you look closely, you can see some tiny insects too. Photo by Jo Roberts. And speaking of colors, what do you call one of these flowers if it is white? A whitebonnet? Ha ha, no, of course not! We love our bluebonnets (and the proper flower name is one word), and don’t want to go confusing people with new-fangled terms, so it is a white bluebonnet. And sometimes there are even pink bluebonnets, but as legend has it, only south of the Alamo. You can read a lot more about bluebonnet history, how bluebonnets beneficially fix nitrogen in the soil, and even the breeding of maroon bluebonnets here. *The Lady Bird Johnson Wildflower Center says six species, but they don’t give details about the sixth, and my other sources say five. If you can tell us about the mysterious sixth species, we would love to hear about it!